The robe is composed of satin Memphis, a black ground figured in white in an Egyptian pattern. The ground is a plain silk of the richest ground, the pattern satin. The corsage is cut low, tight to the shape, and trimmed with a standing tucker of tulle illusion. 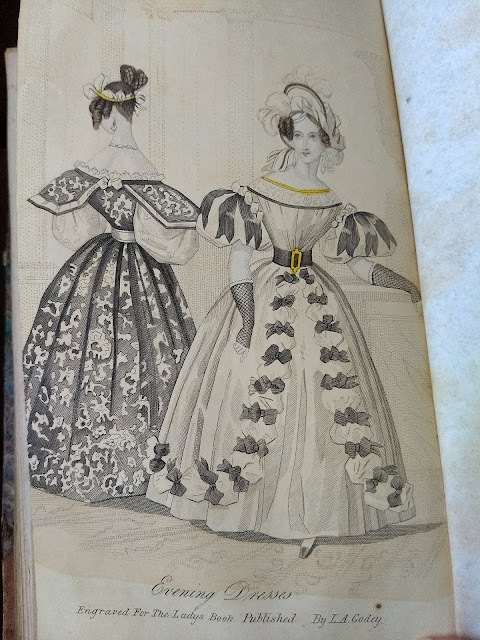 Sleeves à la folle,* of tulle illusion, surmounted by mancherons of the material of the dress, bordered with satin riband, a white ground lightly figured, an edged with black. The ceinture to correspond, is tied in short bows and long floating ends. The hair is parted on the forehead, disposed in luxuriant curls at the sides, and arranged in perpendicular bows formed of plaited braids behind. It is ornamented in a light and novel style, with a half-wreath formed of puffs of rich white gauze riband, which goes round the back of the head, and terminates in knots over each temple. White crape robe over a satin slip; the body is cut sufficiently low to display an embroidered white crape guimpe of the vièrge form. * The corsage rounded at top, and trimmed with a rouleau of black gauze riband, is made full before and behind; the fulness is confined at the waist by a ceinture of rich black riband. Single bouffant sleeves, ornamented with puffings of white riband on the shoulders, and a cluster of floating ends of black over the sleeves. The skirt is trimmed in the tunic style, with a benillon* of white gauze, the puffs formed by bows of black gauze riband. Head dress a white crape toque with a double front, the lower part wreathed in soft folds, the upper high and somewhat of an oval form, is bordered with a rouleau formed of black and white riband. The foundation is round and low; it is trimmed with riband and two bouquets of white ostritch feathers; one rises perpendicularly above the front, the other is attached on the right side in such a manner as to droop in the neck; a third bouquet is inserted between the two fronts on the left side. Black net silk gloves. * guimpe of the vièrge form - a guimpe is a chemisette, and gowns à la vièrge have a shallower/higher neckline than average; "benillon" is, I think, a typo for "bouillon", which refers to creating "bubbles" in a strip of fabric by gathering it at intervals. Unfortunately, there is no explanation as to why what appear to be second- or half-mourning gowns were given for this month. I'm posting the recipes from this one as well, since they might be of interest to costumers for parties! Eleven whites of eggs, beaten up well; 2 1/8 pints of Madeira wine; 1½ lb. loaf sugar; the juice of an orange, and 3½ lemons; a little clove in powder, and cinnamon; half an ounce of isinglass (prepared:) stir the mixture well: let it boil up three times, and take it off. Is a technicality applied to all iced jellies which contain, in the summer, fresh fruits, and in winter, those preserved in ardent spirits. Of iced jellies we shall speak under the general head of ICES..
Infuse 5 oz. Mocha coffee, pulverized or ground; strain off the decoction; boil up 6 oz. prepared isinglass, and 8 oz. loaf sugar, which add to the decoction: -- add also a little brandy. Treat in the same way, and use the same quantities. Boil clarified sugar so as to obtain 1 pint syrup; to which add 2½ oz. prepared isinglass, and 3¼ pints milk of almonds. Let the whole boil, and add (stirring well) any essence or delicate tint you may think proper. Are elegant articles, and are made by putting the common jellies into shallow moulds in the stove, leaving them there ten hours, and then candying them.